The Calgary Flames are among the top teams in the entire National Hockey League as the 2018-19 season approaches its conclusion. They sit atop the Western Conference and Pacific Division standings. But like several other teams, the Flames have relied on two goaltenders to get to where they are this season. 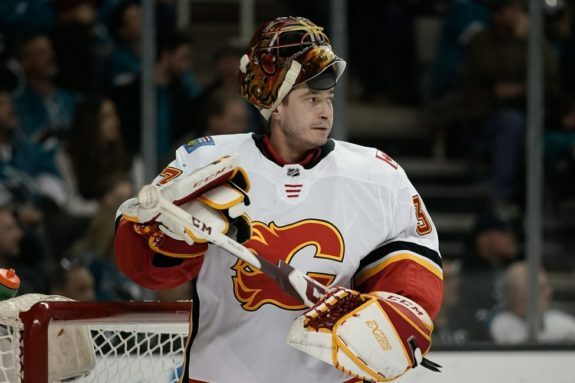 While veteran Mike Smith may be a bit more of a known commodity, it makes a lot more sense for the Flames to go with David Rittich in net when the post-season begins. Smith is an experienced NHL goaltender, with over a decade and 500 games under his belt as a starter. He’s played in the Stanley Cup playoffs and finished fourth in Vezina balloting in 2011-12. At this point of his career, he’s very much a known quantity as far as goaltenders go. On the flip side, Rittich is much more of a blank slate. He turns 27 in August, making him over 10 years younger than Smith. He’s played fewer than 70 NHL games and has only been in North America for three seasons. He hasn’t played in the Stanley Cup playoffs or generated Vezina buzz in his career because this is his first NHL season. The Flames have zero big league goaltenders signed for the 2019-20 season. Rittich is a pending restricted free agent while Smith is a pending unrestricted free agent who (based on his age) might not even be an NHLer next season. Given the age disparity, it seems like smart asset management to resign Rittich. If they’re going to retain him, it makes sense for them to play him a ton in the post-season and figure out exactly what he is – a starter or a good backup – so they know what else they need to do this off-season. Rittich got his big break with the Flames in the second half of the 2017-18 season. At the time he was Smith’s backup and became the de facto starter when Smith suffered a lower body injury and missed a month. While his numbers didn’t set the world on fire, it was Rittich’s first chance to carry the workload for the Flames. David Rittich makes a glove save against the Edmonton Oilers. When Smith struggled to open this season, Rittich’s experience from the prior season gave the team confidence in giving him some early games. He built upon his struggles from the prior spring and put together a strong run that allowed Smith to work on his game in practice and find his swagger. His performance also helped push the Flames towards the top of the standings, which wouldn’t have been possible with a lesser netminder as Smith’s tandem-mate. Without Rittich, there’s no way the Flames would be where they are. Given how important he was to their success, it makes a lot of sense to reward him with key playoff starts. The gap between the two goalies this season is just as stark focusing on just this season. At even strength Rittich has a .921 save percentage and Smith .906. But the situational breakdown from Natural Stat Trick, showing the percentage of high, medium and low-danger shots stopped, shows the dynamics of the two goaltenders. While Smith is slightly better at stopping low-danger shots – and the difference is negligible – Rittich is the better goaltender when the games get tough. The playoffs feature wild games with big swings, and given his numbers and track record Rittich is the goalie that gives the Flames the better chance to win those types of games. The Flames are well-positioned to go on a long playoff run and it’s easy to understand the temptation to go with the older, more established goaltending option in Smith. But let’s be honest here: they’re unlikely to win a Stanley Cup this season – Tampa Bay seems like a runaway favourite – and if they’re serious about building their team to be a long term contender in the West, they need to keep developing Rittich. In order to keep developing him, they need to ride him in the playoffs.